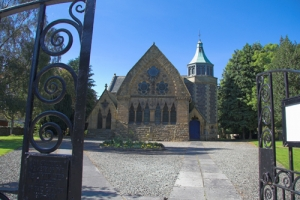 Formerly known as the Parish Church, Innerleithen Church in Leithen Road was built in 1866 to meet the needs of an expanding congregation. Its unusual design was the work of an architect known as "The Eccentric Pilkington". Old photographs of the building reveal that the church originally had a small spire which was later removed, possibly because of the stress on the roof. The bell tower was a later addition. Mathison had undertaken the demolition of the former parish church at the Kirklands and had discovered an intricately carved fragment of an ancient Celtic cross in the foundations. Known locally as the "Runic Cross" - this early Christian artefact can be seen in the grounds at the front of the church.